I’m at my parents’ house, at the kitchen table to be precise, holding a cup of coffee. Once again, my life has changed drastically. Only a couple of weeks ago I was a pan-African cyclist. Now that I lost that excuse I am no more than an unemployed 28 year old man who lives with his parents. Besides the WordPress admin page that I use to update this website, I also opened a word processor on my laptop. For the past three hours I’ve been staring at my father’s sheep through the kitchen window. Meanwhile I ponder how one can state on a resume that one cycled across Africa in a way that doesn’t catapult one’s future job applications into the rubbish bin. How about “demonstrated talent of finding places to sleep for free, extremely productive in sandy meeting rooms above 40°C“? In all seriousness, despite a mild reverse culture shock, I am very happy! The past year has been nothing short of life changing. Now that there are no more miles to cover I can finally sit back and realize how extraordinary it all was, also whilst staring at my father’s sheep. 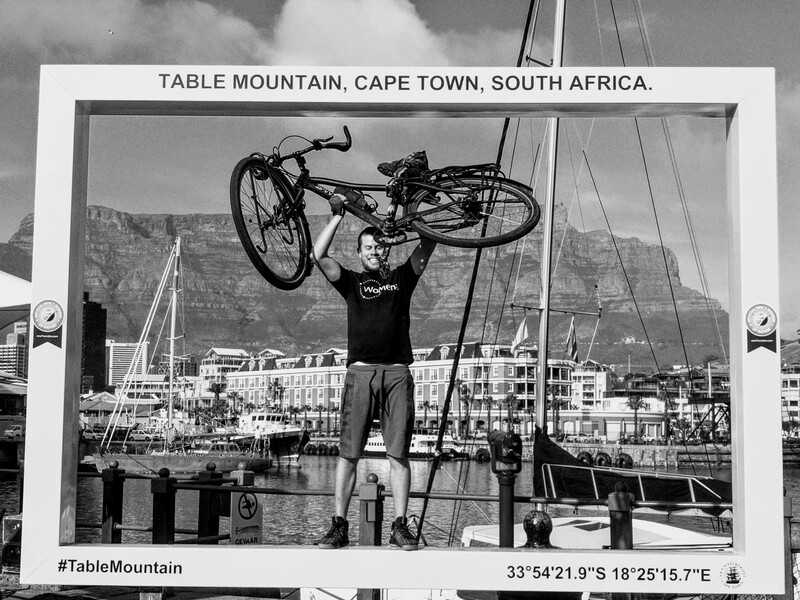 I cycled into Cape Town on July 16th, screaming at ill-mannered taxi drivers who rush to pick up customers, after 20.558km in 21 countries. 368 days along winding roads and surrounded by lovely people, and an equal number of nights in houses, huts, desert tents, police stations, schools, brothels, and my good-ol’ fashioned tent. I can hardly express how thrilled I am to check “road to Cape Town” off my bucket list. It’s been a while since I published my last post. Even I had to think about where I ended the last update. It was in Windhoek, Namibia’s capital. So let’s start from there! I lit a candle for good luck in Windhoek’s Christuskirche and started the final 2000km to Cape Town. I stacked up enough food to survive world war III. I spent long days alone on gravel roads. My gear started to break down piece by piece. I injured a finger at my favorite camping spot. For the first time I met mostly (South-African) tourists. My old crush for desert roads was reignited into an all-out love affair. I met two cycling legends in the south of Namibia. 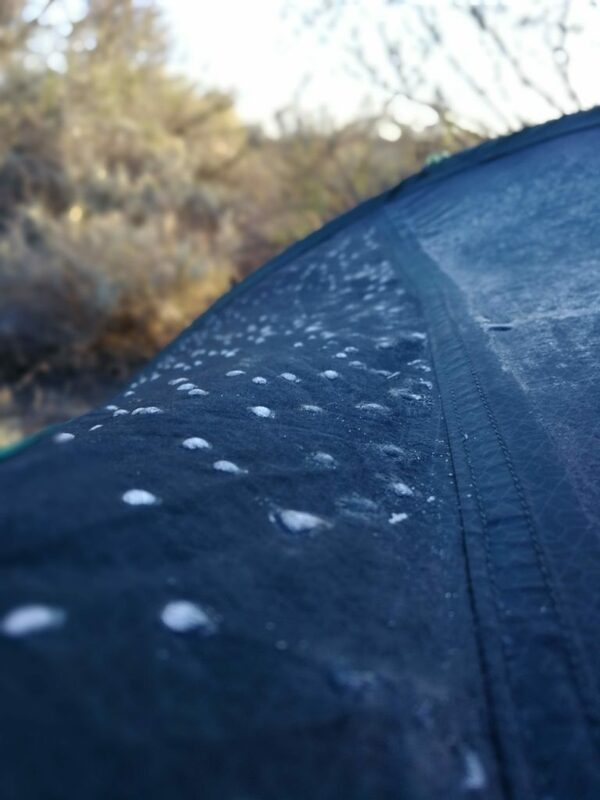 I found ice on my tent in the morning. 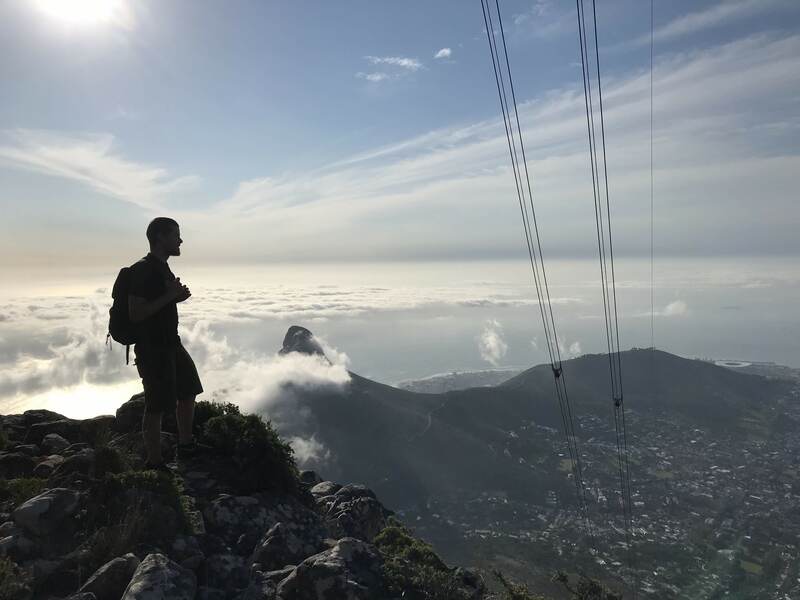 I finally arrived in Cape Town and had a great time! 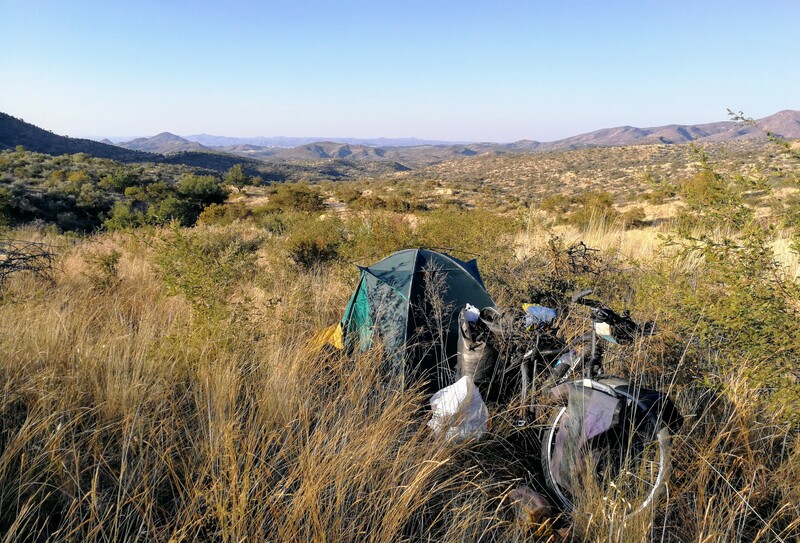 After three days in a smelly dormitory in Windhoek I jumped on my bike again. This has been a reoccurring pattern over the past twelve months: I cycle for a couple of weeks in rural areas, take a break in a larger city until my legs start missing, and then hit the road. Leaving Windhoek felt different somehow. It felt different because it announced the beginning of the very last stage. 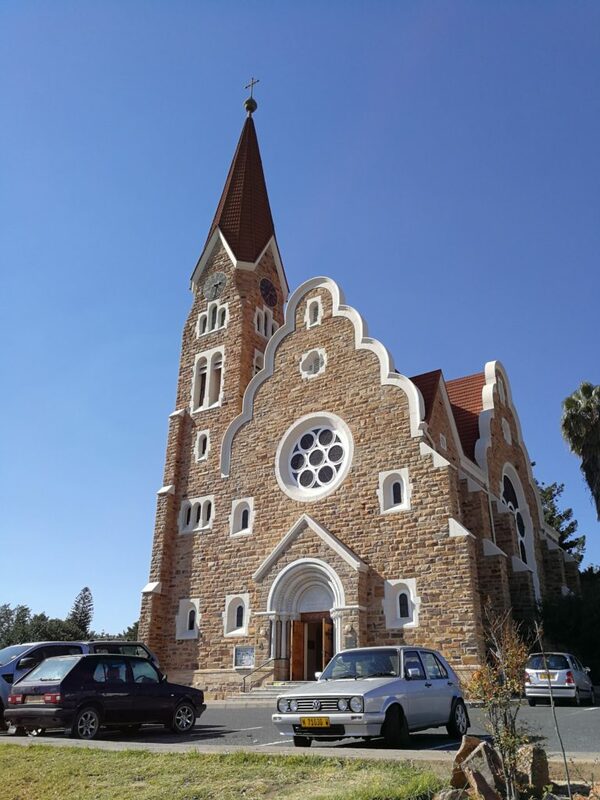 On my way out of Windhoek I stopped by the Christuskirche, one of the well-preserved remains of German colonialism in Namibia, before climbing into the hills surrounding the city. 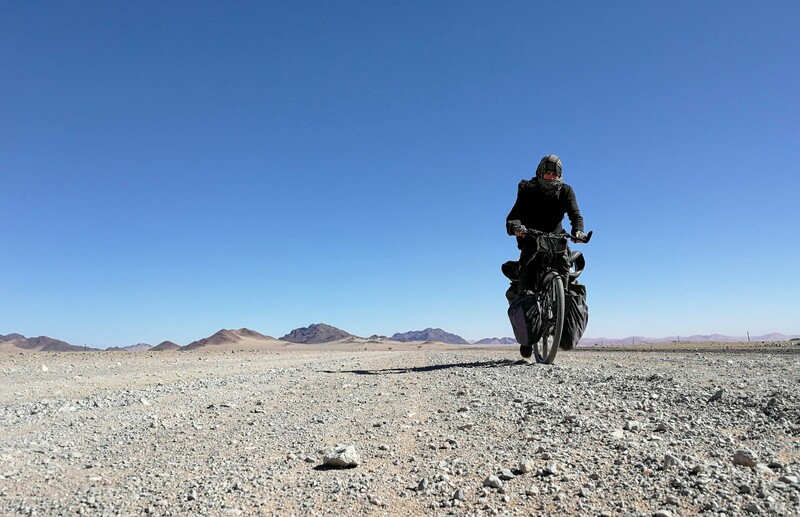 I cycled south on a gravel road (C26 & D1275) towards the Namib desert, passing through the Khomas highlands first. 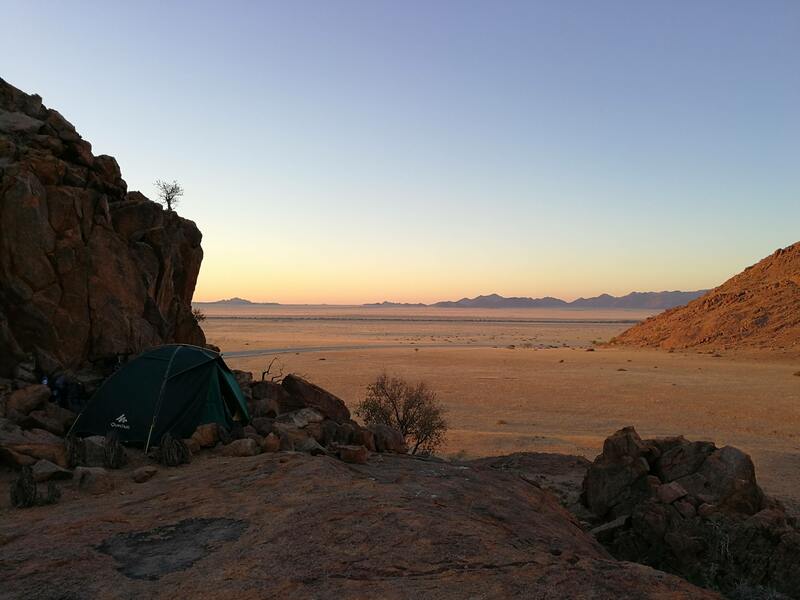 The first evening I could still spot the outskirts of Windhoek from my camping spot (the white dots in between the hills in the picture above). The next day I climbed some more hills, and the day after that even more. 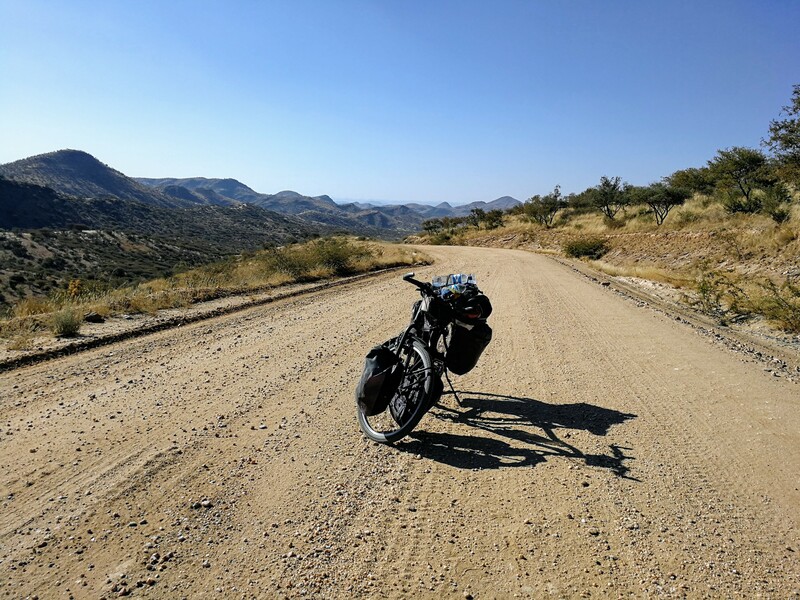 Southern Namibia is empty, very empty, so I had stacked up enough food and 15 liters of water. Whenever I did see other homo sapiens, about every 100km on farmland, I asked for water. The picture above shows you my food reserve on the third night. I bought some “droogwors” from Gemsbok (Oryx) at the only farm I passed that day. I bought a lot of canned vegetables, Indian stlye, in Windhoek as well. My favorite food for cycling is bread with peanut butter and honey BTW. It gives me more wings than all the energy drinks in the world combined. The first three days after leaving Windhoek were not easy, but a lot of fun. 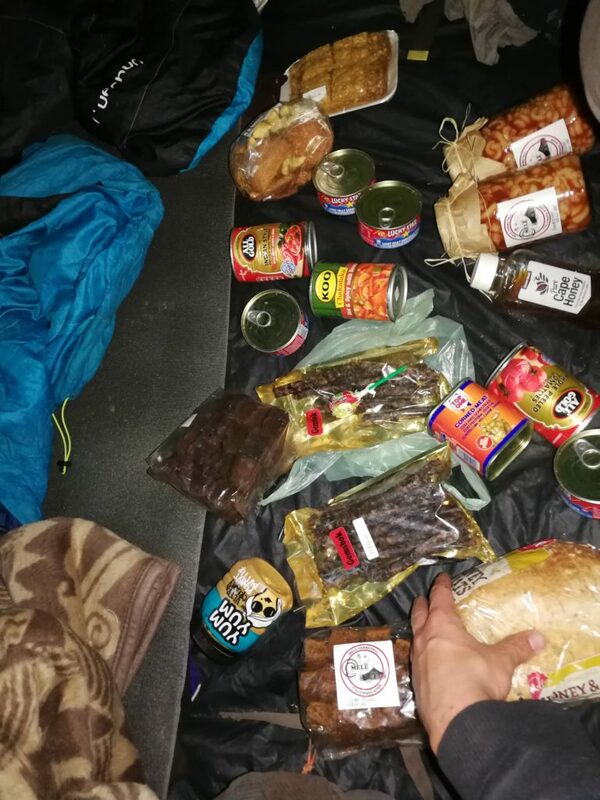 The added weight of the extra food and water brought the total weight up to around 55kg (bike+luggage), and the gravel radiated heat from the sun, especially during the uphill sections. I enjoyed every second though! 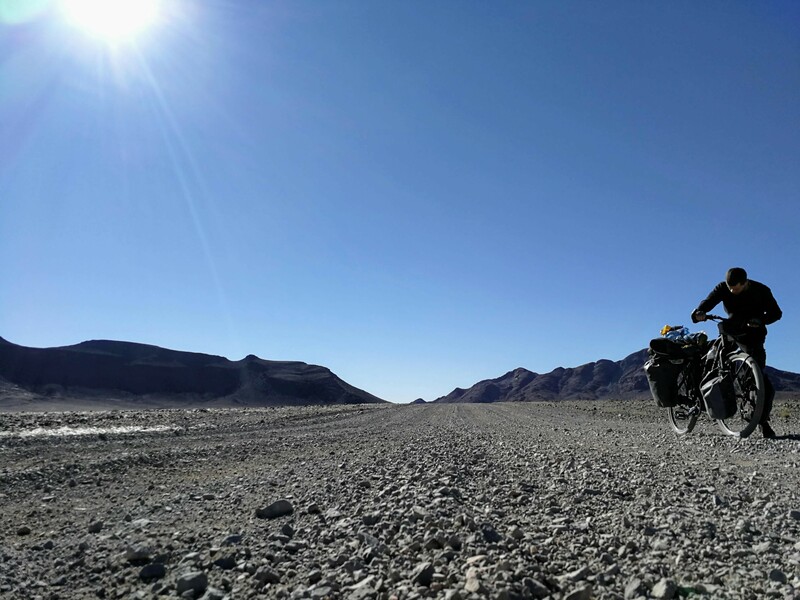 On day four I arrived at Spreetshoogte Pass, a mountain pass connecting the Khomas Highlands with the Namib Desert. A very steep descent brought me to a lower plateau. The picture below shows the beginning of that descent, as well as the end on the right hand side. I spent most nights in the wild. I was very aware that these would be my last nights of camping in the African wilderness, possibly for many years to come. Therefore, I made the most out of them. Every night when the sky was clear, I’d try to spot stellar constellations that are only visible south of the equator. My favorite? The “southern cross”. I did not meet many locals, mostly because barely anyone lives in southern Namibia apart from a handful of farmers. I did meet, however, a lot of tourists who had also come to admire the same views and nature as I. On one occasion a bus of Chinese tourists passed by slowly so they could all take a picture of me (I like attention so I don’t care). Below is a non-exhaustive collection of people who stopped to chat. They all seemed surprised to see me on the road and offered me food or water. Most of them are South African. 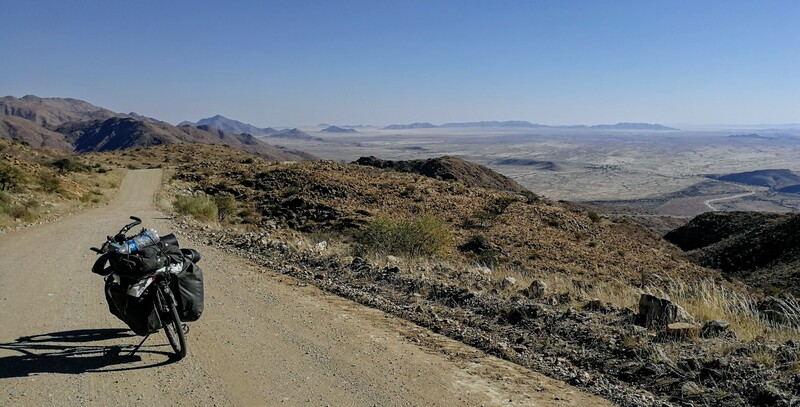 Driving up to Namibia for South Africans is comparable to Belgians going to the South of France. It’s doable by car, yet it feels far from home. The day following the passage at Spreetshoogte I was cycling at sunset near a place called Solitaire. 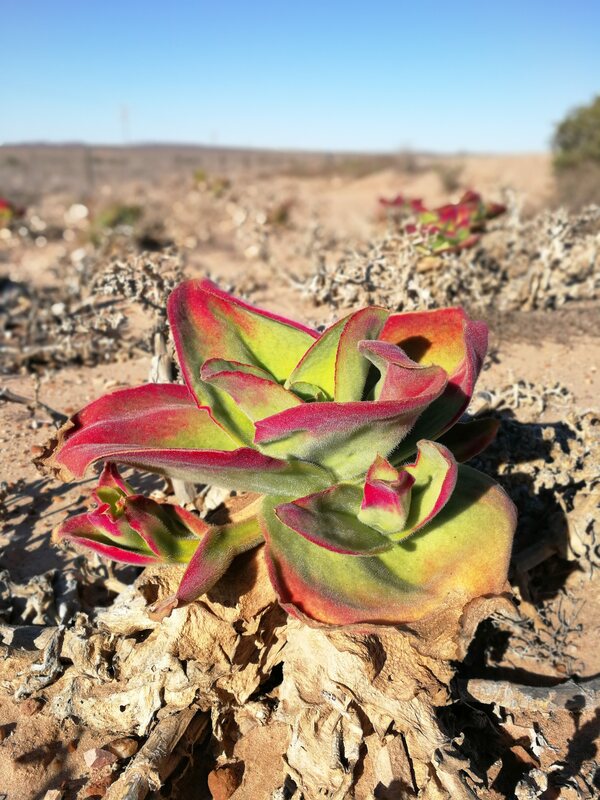 By then I was close to the Namib desert so the landscape had become rather dry. I spotted what I immediately considered to be possibly the best camping spot in my life. Just a stone’s throw from where I was cycling, halfway up on a hill. I did not, however, take into account that a storm was announced for that night. The picture below shows how it looked one minute after I had pitched my tent. Around midnight heavy winds shook up my tent. The wind gained speed as it blew across the side of the hill, making the corner where my tent stood the worst point to be at. The two poles that hold up the tent snapped. 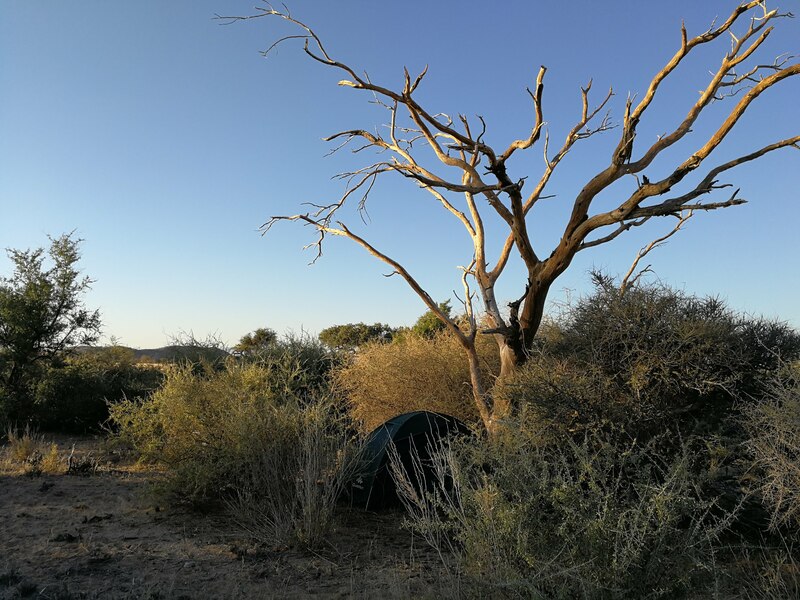 I tried to drag the tent towards a safer place, but I fell on the rocks outside and hurt my finger (I couldn’t break with one hand for a week)… I did see hyena’s in the morning from my broken tent! So officially my favorite spot of the entire Damme to Cape Town journey! 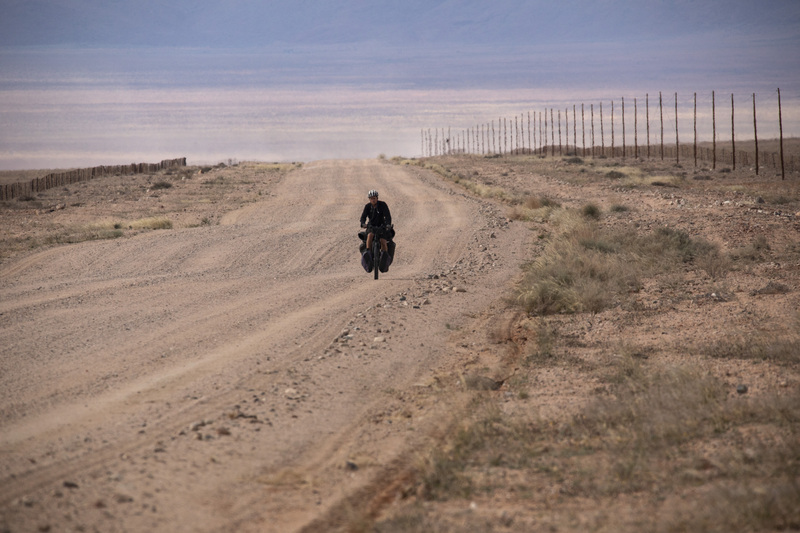 By then I started to get the hang of Namibian gravel roads. Depending on the state of the gravel I added or released pressure from my tires to find the perfect balance. Every section has a different level of air pressure, combined with a certain speed, that smooths out the bumps. When I find that perfect balance… oh what a feeling! If any of the pro cycling teams need a specialist for the cobble races next spring … I’m your guy! The wind stayed strong, and my average speed remained well below 10km/h. I was also blown off the road by gusts of wind twice. 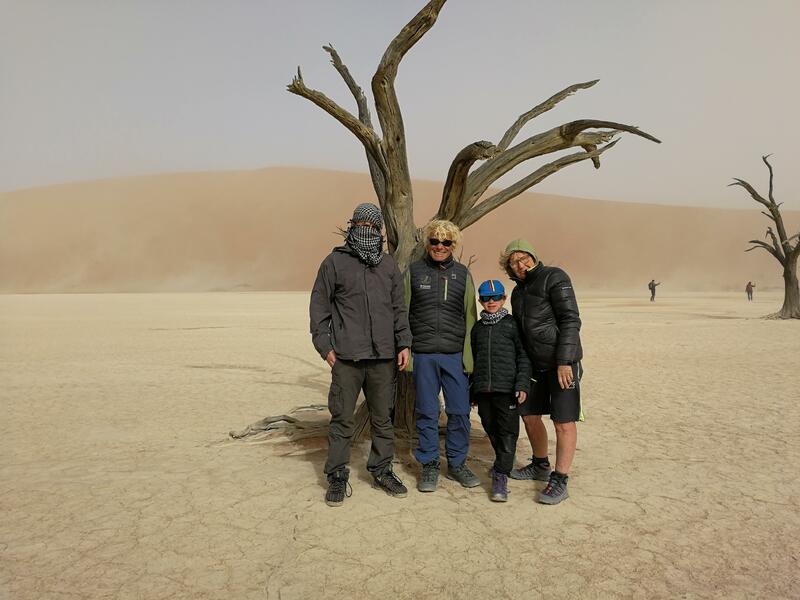 I arrived at “Sossusvlei”, one of the main tourist attractions in Namibia, where I met a Belgian family at the only gas station. 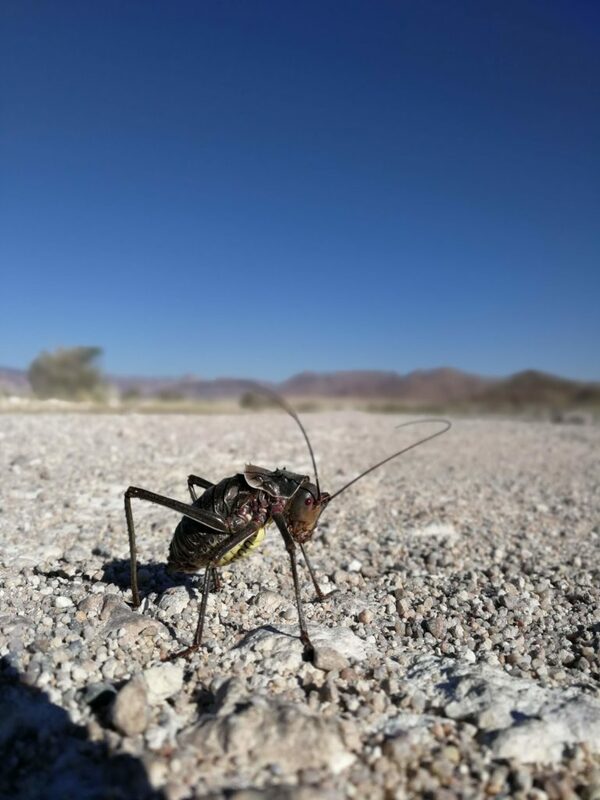 The next day I hopped into their 4×4 to visit the Sossusvlei national park. This national park has the highest sand dunes in the world, and features the famous “deadvlei”. Because of the wind, visibility was limited. The following section, towards the border with South Africa, reminded me of Mauritania. Dry, tough, and windy. 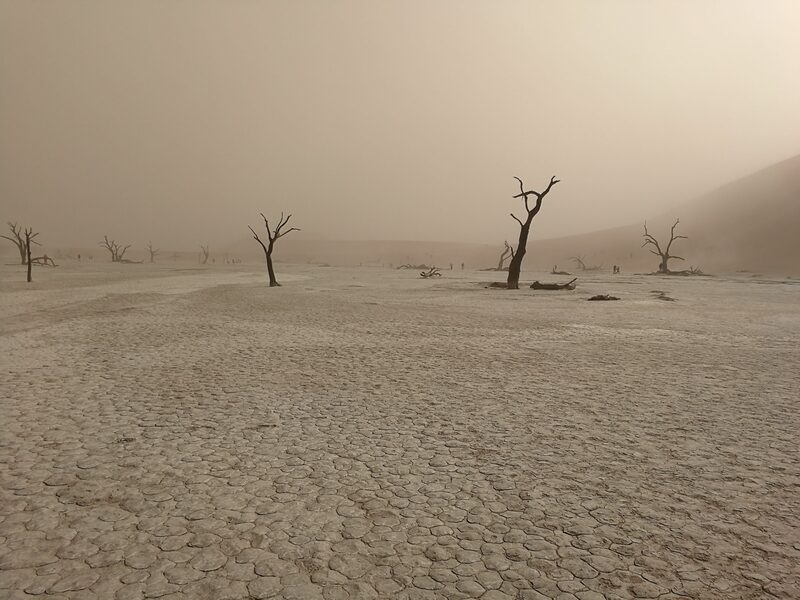 Some of the challenges I faced in the Sahara reappeared. I had to wear long sleeves and pants to protect my skin from the sand carried in the wind, and my eyes felt dry and irritated when I wore contact lenses. 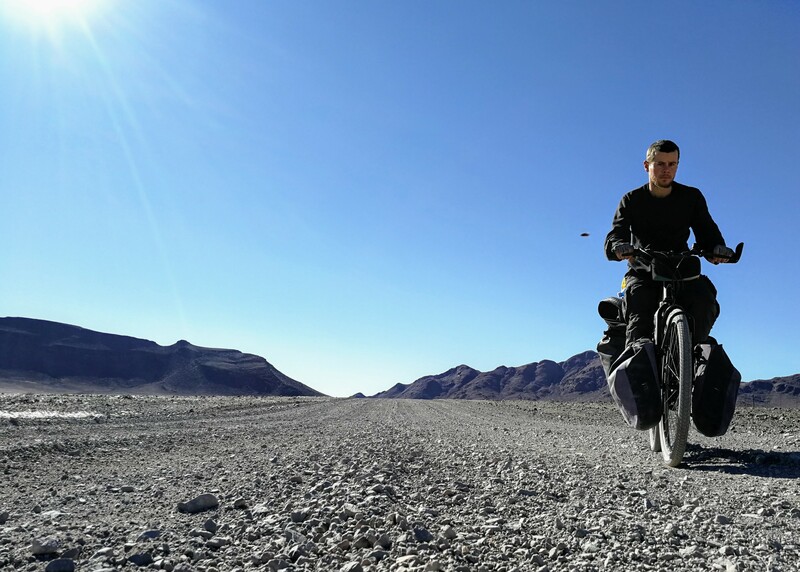 Despite these minor inconveniences, there is nothing I like more than cycling in a desert landscape! I generally like spending hours of struggling against the wind, it somehow makes me feel alive. I also love the emptiness of desert, I find it very peaceful. At night I stayed in what remained of my tent. I managed to fix one arching pole, and I tied one or multiple strings to a tree to keep the structure upright. It did not look pretty, but it did the job. Also, my inflatable mattress had been punctured by thorns beyond repair. But I managed to find a little yoga mat to sleep on. I camped this way until Cape Town. On a few occasions tourists snapped pics as I approached them. The picture below was taken and sent to me by a lovely Italian lady, who also gave me water and apples. Thank you Cinzia Marchi! 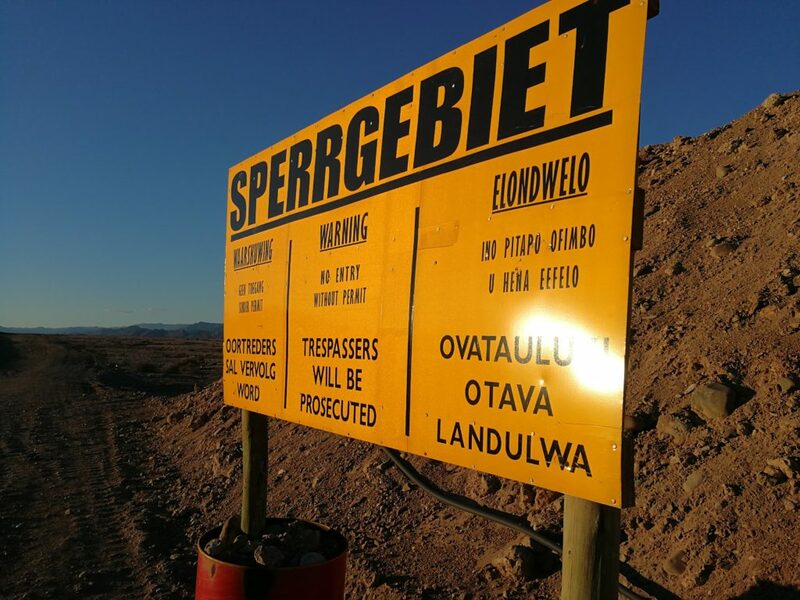 The final 80km in Namibia took me along an area that is classified as “sperrgebiet”. This term dates back to German colonial times, and refers to an area that is off-limits to the general population because of (diamond) mining activities. Illegal mining is still an issue, so this is taken very serious. I was planning to camp wild, but as it was getting dark I noticed the same security vehicle past me by multiple times, and I could sense that they were keeping an eye on me. I did not want to break the law in sperrgebiet, so I cycled all the way to the border. I arrived at 1a.m. at night, only to find that there was nobody, and that the bridge over the orange river into South Africa was closed. The next morning a security guard woke me up at 6a.m. after I had fallen asleep on the doorstep of the immigration office. Still half asleep, I cycled into South Africa 15 minutes later. The border passage went flawless, I was positively surprised to see that the South African immigration service gives away free condoms to all visitors. 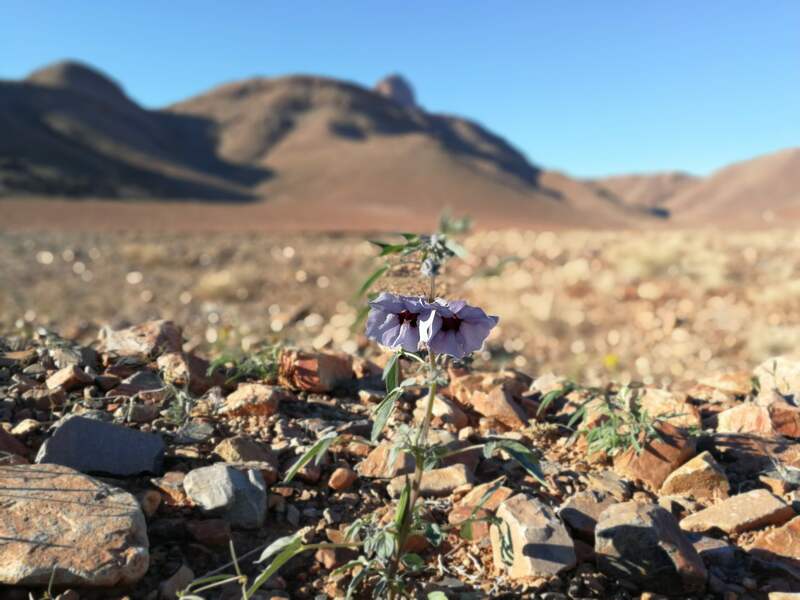 South of the Orange river plants had clearly taken advantage of the recent rainfall. From the border in Alexander Bay to Port Nolloth I enjoyed the first stretch of tar road in weeks. In Port Nolloth I saw the ocean for the first time since Ghana, so I camped on the beach. This was my view from the tent during dinner. 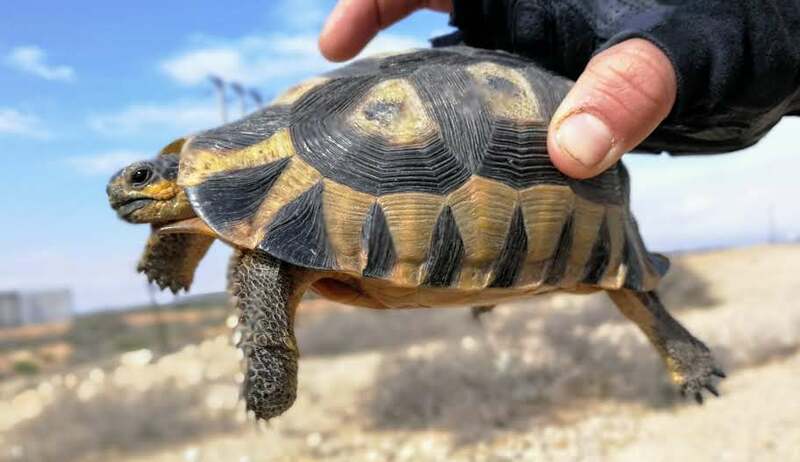 This area has plenty of ostriches, as well as turtles. Finally an animal I can photograph easily! In my previous post I complained about the endless fences in Namibia. This has been a constant factor throughout the final 3000km to Cape Town. What did change is that I became more skilled at finding weak spots in these fences, and took it as a challenge to camp wild despite all efforts to keep strangers out. July is mid-winter in South Africa. Although I could still cycle in shorts & T-shirt during the day, at night it gets very cold. The picture below is the last picture with my phone before Cape Town. the screen literally froze after I took it, just like the top of my tent. 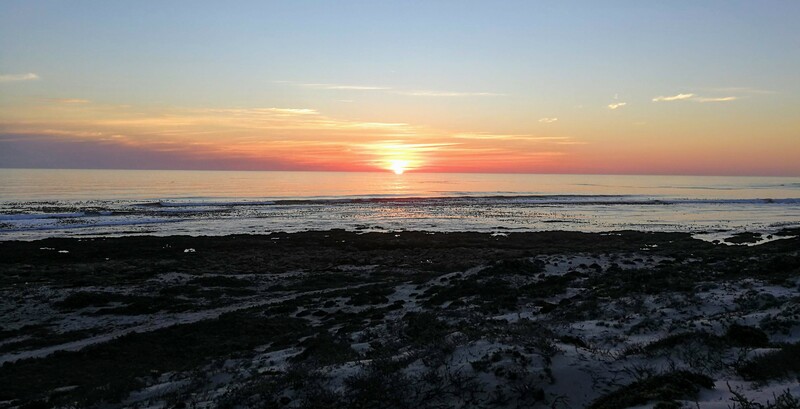 I cycled along the coast of the northern and western Cape along picturesque fishing villages with cute names such as Kleinsee and Hondsklipbaai. 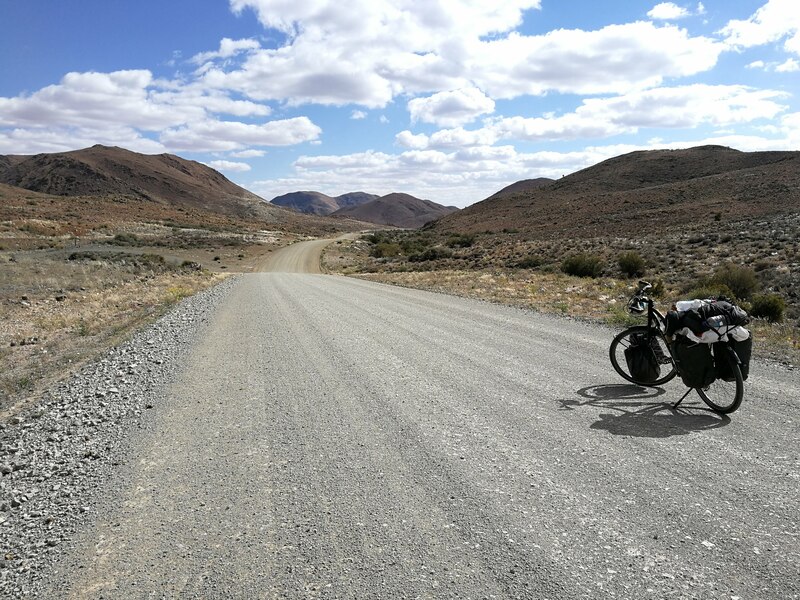 I cycled south along the N7, winding through the hills along the Olifantrivier. Along endless fields of citrus fruits and farm stalls, over a mountain ridge in Piketberg, and down into South Africa’s most well known vineyards. I stayed with Hannes and Karita, and their cat Witvoet, in Paarl for one night. 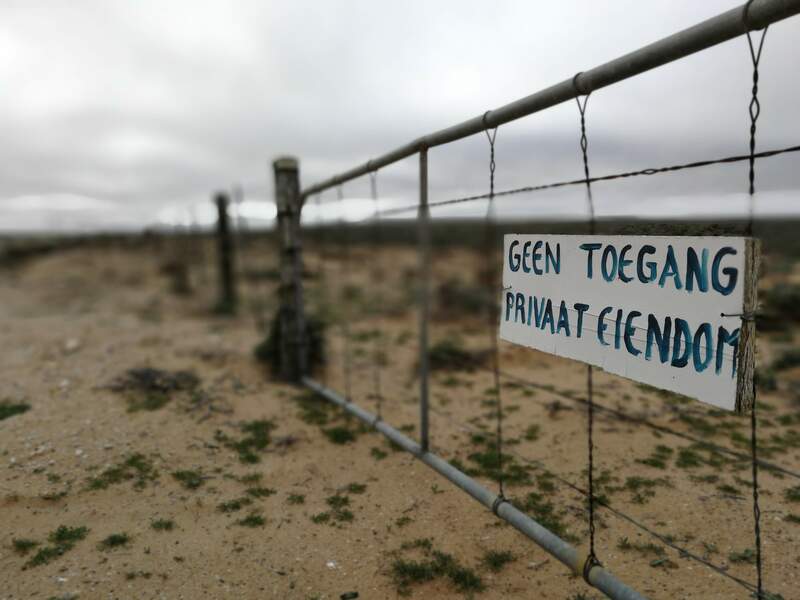 Hannes and Karita are two Afrikaners who had a citrus farm for thirty years. Witvoet is a 25 year old cat who demands constant attention. I found a phone repair shop in Klapmuts. I finally cycled into Cape Town. In Cape Town I stayed with the King family. I met Patrick King when he was photographing the N7 road near Citrusdal as part of an assignment by the roads agency to document the progress of construction works. 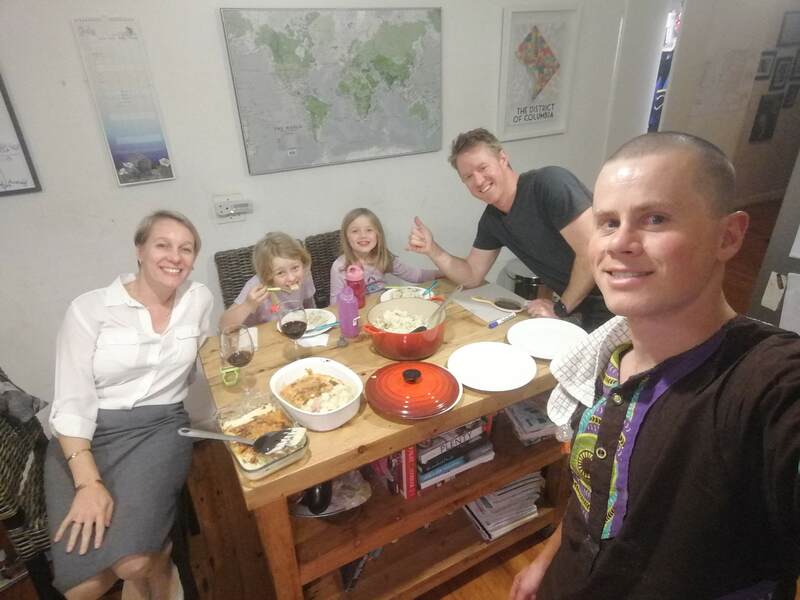 He spoke with an American accent and told me that he volunteered in Malawi for two years after graduating, and that while he was traveling with fellow volunteers he met his wife Kelley. He invited me to stay with his family when I arrived in Cape Town. The two girls always entertained me during my stay, and I made a very Belgian dish the last evening: witloof in hespenrolletjes (although I used leak instead of chicory, because none of the stores seem to sell it). Patrick and I also went hiking on table mountain. 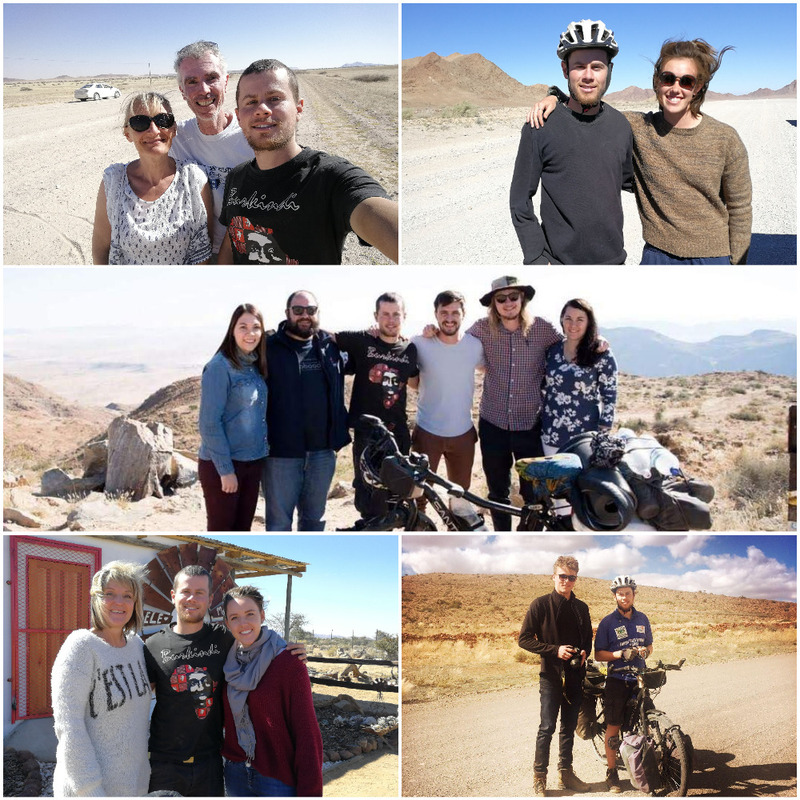 When I was cycling in the south of Namibia I met many South Africans who were on holiday. Among those people were Nicolette and Kevern. I immediately noticed that Kevern had a particular interest in cycling, and then he told me that he had tried to go pro. 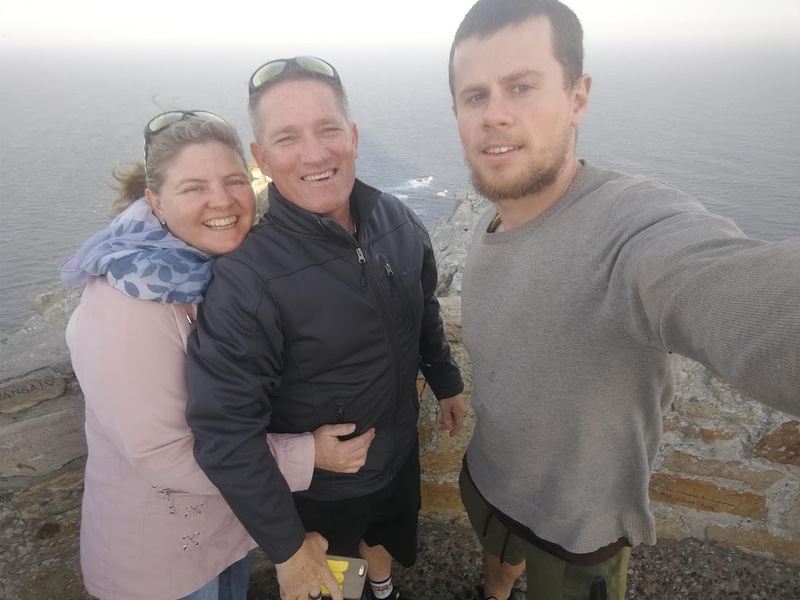 I decided to spend two days with them when I was in Cape Town, and we visited Cape Point together. Kevern lived in Belgium for two years, and he tried to get noticed by the European pro-teams by racing in the Belgian “kermiskoersen” amateur circuit. He also raced Paris Roubaix (my absolute favorite). During his time in Belgium he lived in a house in Ninove with four fellow South African riders. The best story he told me relates to a language misapprehension. In Dutch “poes” means kitten, although it may also refer to female private parts when it’s used in a certain context. In Afrikaans poes only refers to female private parts. One evening Kevern and his South African cycling mates were coming back from a kermiskoers race when one of them noticed a sign that read “poes te koop”. Back then (’94,’95) prostitution in South Africa was illegal (it still is) and none of them had ever seen a brothel before, so they decided to go in and have a look. Five minutes later they were very confused, and none of them had a cleu why the lady who opened the door was showing them a back room with kittens. I booked a very cheap connection with multiple lay-overs back to Belgium. 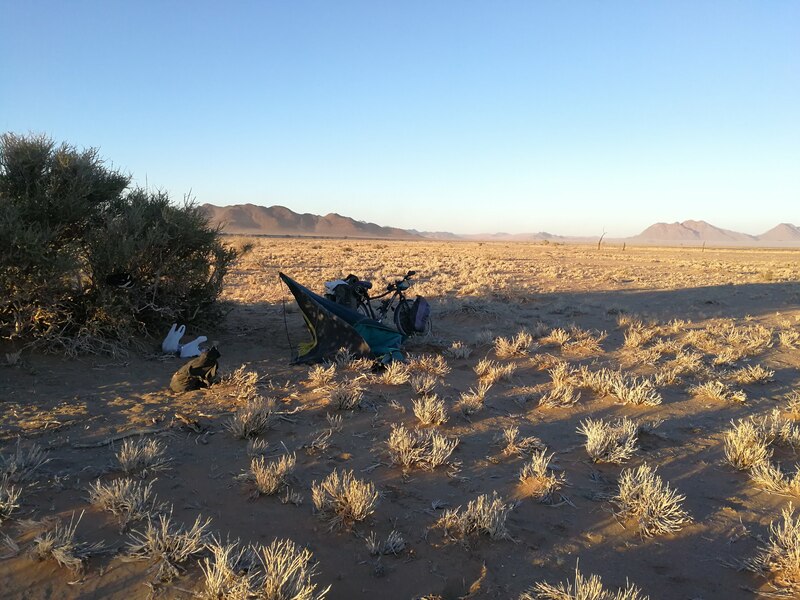 However, I did not want my bicycle to suffer the same fate as I. Luckily I met someone in Port Nolloth who has great connections at DHL. They offered to bring my bicycle to my house for free, because they were so impressed by how far I had come on one bicycle! 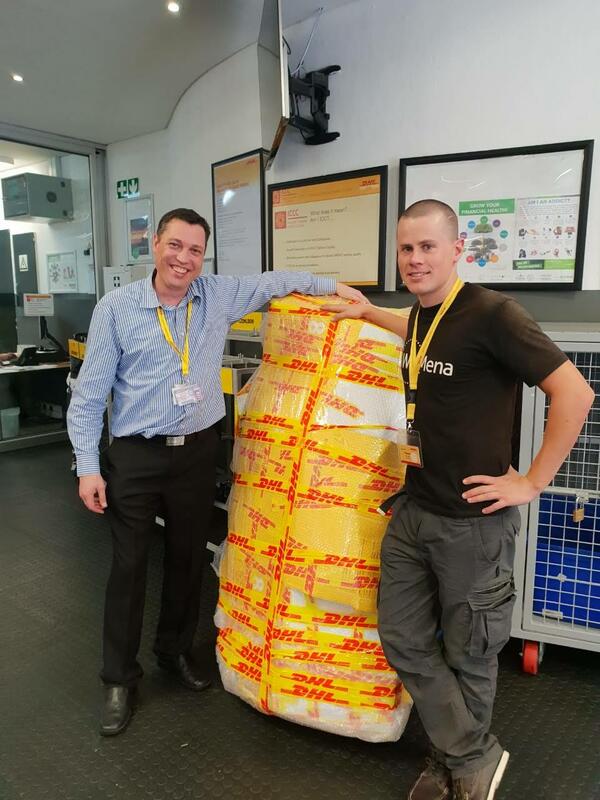 Of course I`d like to thank DHL, and everyone at the DHL Cape Town office for this amazing service! My bicycle arrived 48 hours after I had dropped it off! My final night in Cape Town I stayed at the Radisson Blu hotel. 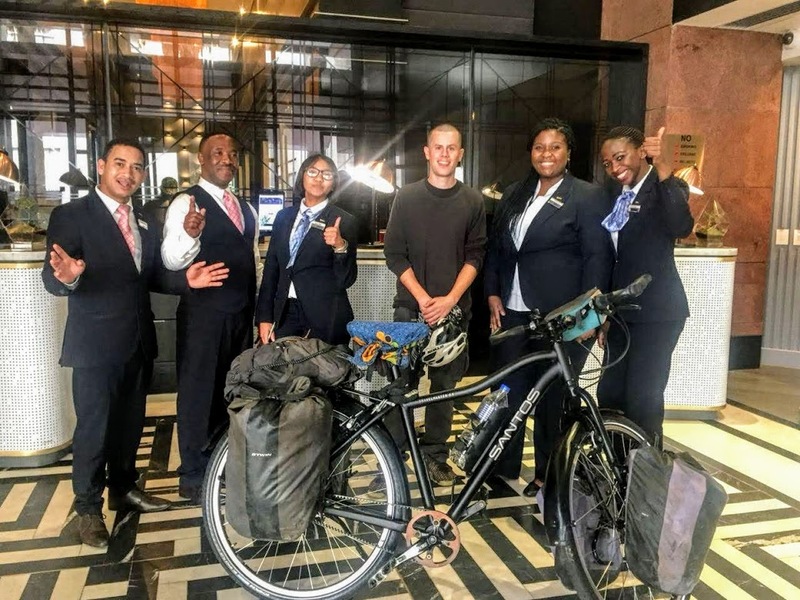 Their marketing coordinator Fikile, who’s standing on my left in the picture below, got word from Patrick about my cycling journey, and invited me to stay at the hotel. Probably my best night of sleep in Africa! So this is where it ends… I did it, I did it! !